The Solarwinds Connector delivers out-of-the-box integration between Solarwinds Orion NPM and RightITnow ECM. This enables IT operations staff to consolidate, correlate and reduce a high volume of events and alerts from Solarwinds Orion NPM via RightITnow ECM’s event correlation technology. IT organizations that use Solarwinds Orion NPM (Network Performance Manager) product gain valuable insight into the performance and status of their monitored network infrastructure devices. Orion NPM supports multiple types of data collection including up/down status based on response to targeted device and interface pings, log messages via Syslog, or performance metrics via SNMP monitors. While this broad data collection provides the IT operation staff with comprehensive visibility into the health of their monitored infrastructure, it also generates a high volume of events per day. Additionally, Solarwinds users who set threshold conditions on performance monitors generate repeated exception alerts each time these are breached. Maintain proactive monitoring coverage of all infrastructure events by using all of the capabilities provided by Solarwinds Orion NPM – but be inundated by a high number of events and alerts that make prioritized operational response difficult. Or, turn down the level of monitoring and run the risk of becoming aware of a problem only after a failure has already occurred. The Solarwinds Connector capability in RightITnow ECM enables IT operations staff to do away with this dilemma. They can pursue comprehensive, proactive monitoring while identifying and responding to the most high impact events and alerts as soon as they are detected. 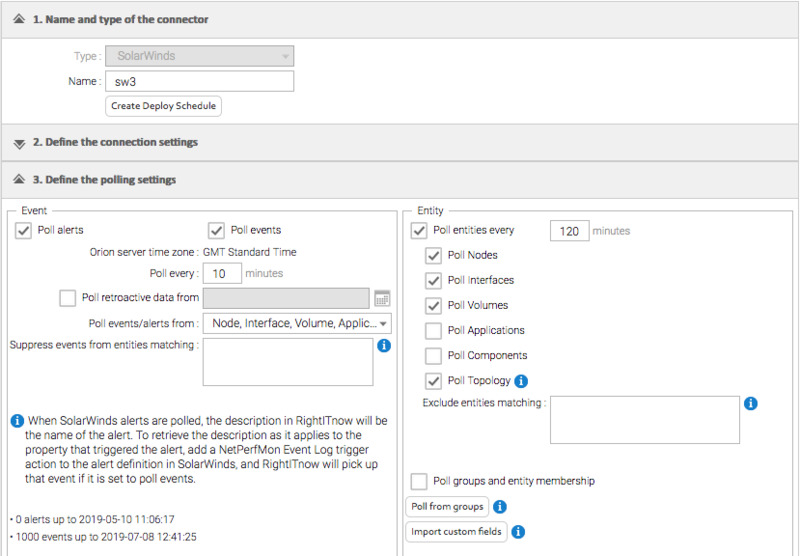 The Solarwinds Connector initially imports all events, alerts, topology and entity information into the RightITnow ECM repository using the Solarwinds Interface Service (SWIS). It is designed to work against multiple instances of Orion NPM. To maintain data and event integrity, it continuously updates RightITnow ECM by periodically checking and updating changes from the Orion NPM database(s). RightITnow ECM’s powerful event correlation engine then reduces the volume of Solarwinds events and alerts into a dramatically lower number of meaningful and service impacting alerts and incidents. IT operations staff can now plan and execute appropriate operational response to these alerts. Why Try the SolarWinds Connector?